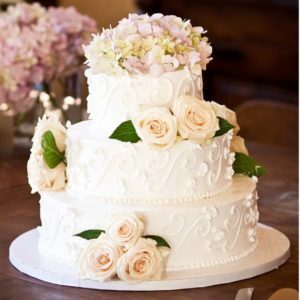 My top wedding cake tips for you on keeping things affordable, wedding cake alternatives, top-tier storage tips & more … listen now! If you’re looking to keep it simple & affordable, go for a smaller sized tier cake, and supplement with sheet cakes. This will be lots less expensive than a huge tiered cake that serves 150 people. 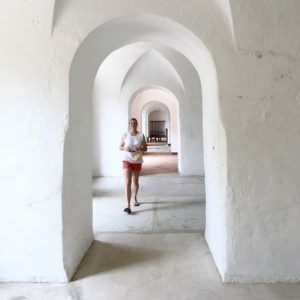 The sheets hide behind the scenes until it’s time to serve, and no one knows the difference between sheets & tiers once the cake is cut & on plates! See, so simple! Our baker decorated with leftover flowers from our centerpieces & bouquets at no extra charge. Do we need to supplement our wedding cake with an additional dessert bar? Absolutely not. It’s an added expense that is totally optional, so if you’re looking for sweet & simple, stick with just the cake. How do we keep the top layer fresh to enjoy on our one year anniversary? First, you’ll need to find an airtight plastic container. You’ll want to wrap the cake in a layer of plastic wrap, again with a layer of foil, and store inside the airtight container in your freezer. Follow these steps and your cake will be like brand new on your one year anniversary! * * * CRITICAL REMINDER! Remember to designate someone in charge of making sure the cake gets taken home from the venue! This is so easy to forget, and it would be heartbreaking to have it accidentally thrown away, or cut & served on accident. As promised, a link to the Wedding Dessert Pinterest Board I mentioned on today’s show! Get lots of visual ideas for brainstorming how your wedding cake will look. Click the board title or image below for more! Wedding Cakes + Sweets on Pinterest, click image for more! Any questions about today’s show? Stories from your cake tasting, or creative wedding dessert ideas you’d like to share? Follow @weddingplanningpodcast on Instagram, and send me a note! 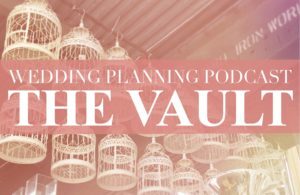 follow @weddingplanningpodcast on Instagram for behind-the-scenes insights & fun!